Cancer Research UK is a UK-based charity doing vital work to raise awareness of cancer and to fund scientists, doctors and nurses to help beat the disease. With no financial support from the government, Cancer Research UK’s existence depends on public donations - many of which are sourced through digital channels. In 2017, the “About Cancer” section of Cancer Research UK’s website amassed over 25 million visitors. The same year the charity raised over £30 million through its online fundraising platform alone - this is why its online presence is so important. Providing a high quality digital experience to both external stakeholders – such as fundraisers, cancer patients and the general public – as well as employees, is non-negotiable. We are encouraging a culture of testing and learning through experimentation which initially we had to fight for. After running the first experiments, our stakeholders had a lightbulb moment. They did not have to take our word for it, but look at the Optimizely data. The figures were a compelling argument to continue experimenting. As a data-driven non-profit organisation that prides itself on world-leading research capabilities, Cancer Research UK took a scientific approach to improving its digital offerings. The team identified clear challenges: Without improved user experience, smarter navigation and a clearer page layout, the charity would miss out on many valuable donations through the course of the year. To test ideas for improvements to the digital experience, the charity is using experimentation. The team counts on the Optimizely experimentation platform to generate the insights necessary to improve user experience and maximise the desired outcome for the organisation. Alongside Optimizely, Cancer Research UK set out to increase awareness and drive a cohesive message both before and during World Cancer Day 2017, an annual event in which the charity encourages the public to unite in the fight against cancer. A/B testing of user interaction with Cancer Research UK’s corresponding landing page revealed excessive noise and undefined call-to-actions to be a key factor impacting user engagement. Ultimately, the existing user interface was detrimental to the goals of the campaign, directly impacting Cancer Research UK’s fundraising efforts. The team developed a second version of the landing page during the campaign period to test out user interaction. The amended version reduced noise and streamlined the user journey to allow for clearer communication and calls-to-action. 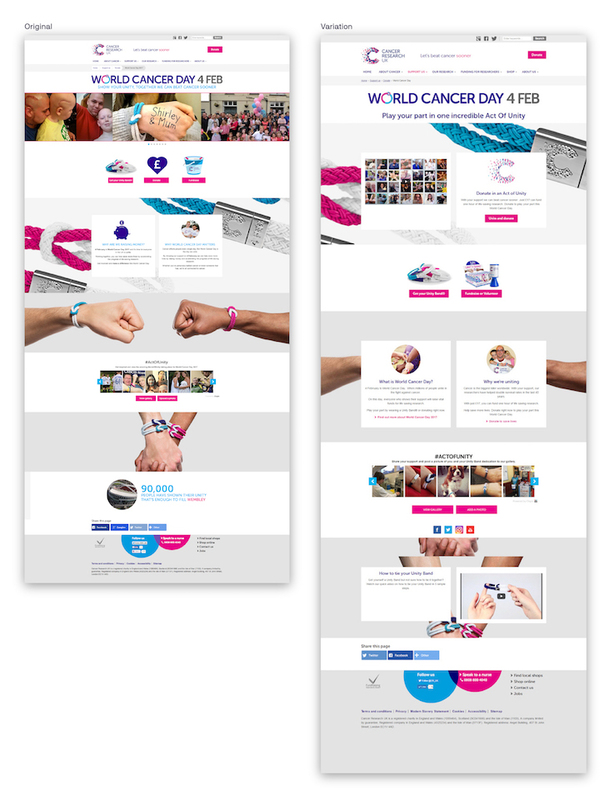 Cancer Research UK found that testing its landing page significantly improved the digital experience and ensured users were able to navigate the site with ease. Over the World Cancer Day 2017 campaign period, Cancer Research UK was able to increase the click through rate through testing by 294%. Critically, the success of the campaign helped internal marketing and management teams to understand and recognise the value of online experiments. This has led to increased internal support for experimentation in future projects. In the short-term, Cancer Research UK is planning to introduce online chat functionality to reduce the volume of calls to its call centre, providing an all-around digital experience for end users. The charity is also actively focusing its efforts on ensuring that it is moving multiple core operations online, such as donations and grant applications. Since the overwhelming success of the campaign, Cancer Research UK has further expanded its digital centre of excellence. 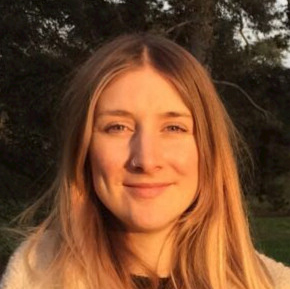 The charity’s culture of experimentation now extends across every department, from junior to senior members of staff, empowering the entire organisation to learn new skills and try their hand at experimentation to improve every aspect of the digital experience. The introduction of internal initiatives such as ‘UX hour’, a daily hour-long knowledge-sharing session where employees come together to bounce off digitally-led ideas and suggestions, is a testament to Cancer Research UK’s bold approach to embedding experimentation into its culture. The charity is focused on becoming even more effective at raising money, educating the public and shaping policies in an effort to save more lives. Experimentation will continue to play a major role in the team meeting these goals, for a charity that is setting the standard in the sector.